Composting has grown as an acceptable and eco-friendly waste reduction program. Many people have taken to composting due the the wide array of benefits that you can receive by composting at home. Not only will composting cut back on the amount of waste you produce, but it also provides a nutrient rich base for your garden as well. Did you know that many cities across the United States are adopting urban and commercial composting systems? It's true! Cities including Seattle, WA and Portland, OR provide composting bins to residents as an eco-friendly addition to trash pick up. This is a recent undertaking by a number of cities to try and cut back on urban waste. Composting is a great alternative to just throwing items in the trash. Certain items that you throw away can be naturally decomposed quickly instead of being carted off to a landfill. Composting then allows these materials to break down in an organic way, reducing the trash burden and producing a nutrient rich waste that can be used in gardens and farms. Composting can easily be done at the residential level, and many people actively partake in a composting regimen at their home. Composting at a commercial level can bring up a number of issues. 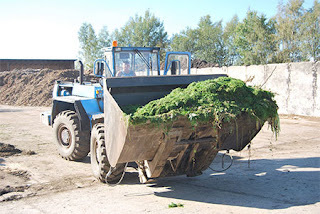 Initially, composting in such a large volume can be difficult. This is why it's important that any city or company that decides to take on a commercial composting regimen should have some sort of composting infrastructure for it's residents or employees. For example, when Los Angeles was required by California to offer a composting solution to the green waste issue, the resulting compost yard made profit by selling its compost to large growers and landscaping services. Setting up an infrastructure like this can help to make an even more positive impact on the local economy in addition to the environment. Another issue that is actively being tackled by those composting commercially is contamination of crops. When mass amounts of compost are collected from various sources, heaps of herbicides, pesticides, and other chemicals hazardous to agriculture come into the resulting compost. A solution that may come into play here is to set up guidelines on what can be composted. While this may limit the amount of compostable materials, the results would still be positive in the same way that recycling has provided many benefits since its growth in the US in the 1970s. Regardless of the issues still being worked out, composting on a wide scale can cut back on a large amount of household, commercial, and urban waste. Creating a large amount of nutrient rich compost can also benefit a number of local farmers in an area! Think of all of the benefits that can arise from having a composting system set up in your city. Composting can be performed on a commercial level with the proper materials and infrastructure put into place. Setting this up in any place, city or workplace can be a worthwhile undertaking that provides a great solution to a growing waste problem, especially in large urban areas. Do you want to lobby for composting in your city? Bring this issue to your local government representatives to see if a composting program for your city would be a possibility. You can also seek out local groups around the internet and neighborhood to see what progress has already been made! On a smaller level, you can start composting at your home at any time! Getting started with composting is easy. At Teraganix, we have a variety of composting kits and materials so that you can begin a composting regimen right at home! Use your compost to nourish your garden and reduce your amount of household waste. Easily implement composting in your everyday life by learning acceptable materials for composting bins and beginning to separate your household waste accordingly. We also have a variety of blogs covering additional information on composting and how you can get started composting at home!